Along with its stunning Caribbean beaches and laidback charm, Tulum also offers a rich cultural heritage and a host of interesting activities for the visitor. Explore its ancient Mayan ruins, snorkel in a fresh water cenote or take a tour of the Sian Ka’an Biological Reserve. Or just while away the afternoon rambling through its rustic streets and enjoying a delicious meal at one of our local restaurants. With the perfect combination of tranquility and beckoning adventure, Tulum is more than a place; it’s an experience that is sure to delight, surprise and enchant you. -Complimentary Wi-Fi and a computer located in the reception area where you can check email or gather information on activities in Tulum. 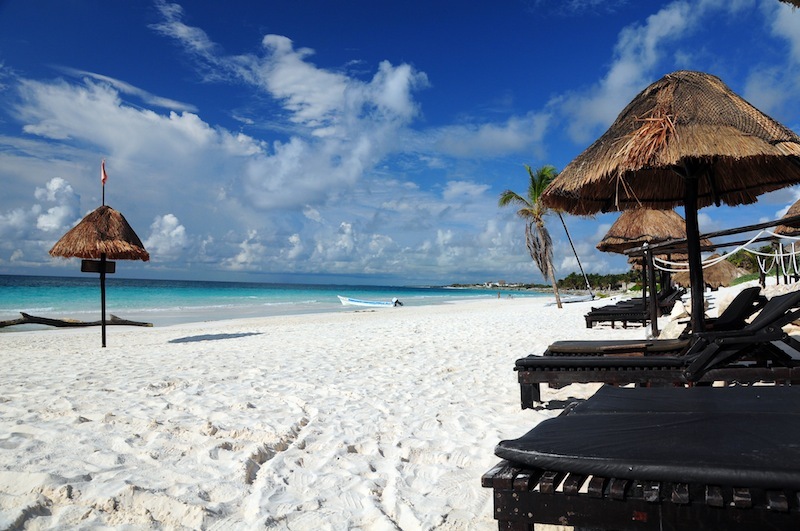 - We also have a collection of information on tours and activities in Tulum and the surrounding area. - Friendly staff to help you with any of your additional needs. Enjoy the flavors of the Caribbean. 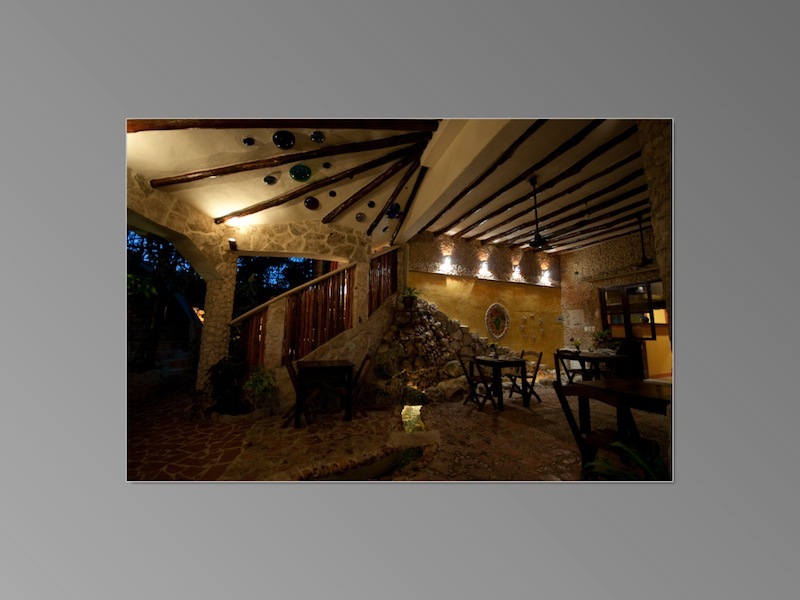 The delicious food and charming ambience of our restaurant are sure to enchant you. 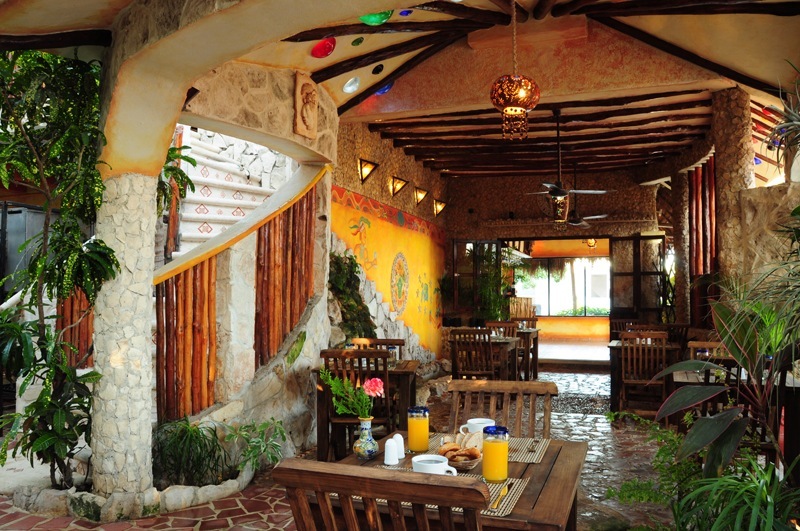 Decorated with colorful murals and fountains of Mayan rock, this cozy grotto is the perfect place to enjoy a meal. We begin service at 7:30 am and are open until 10pm. Treat your palette to a tasty Mexican breakfast or one of our delectable gourmet sandwiches. We also have our very own bakery that offers homemade bread, exquisite pastries, cakes, baguettes and croissants throughout the day. Your stay at Maison Tulum also gives you access to La Vita e Bella, a private beach club located just 10 minutes from the hotel. 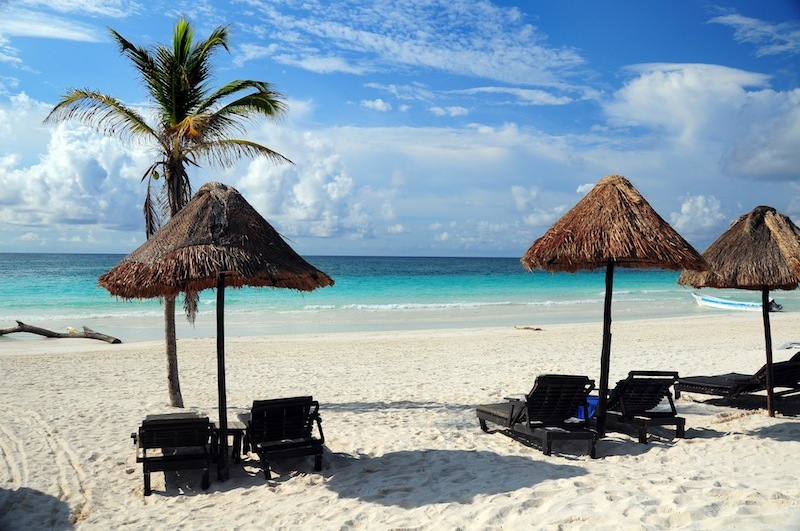 Feel free to stretch out on a lounge chair and enjoy one of the most pristine beaches in the Caribbean. 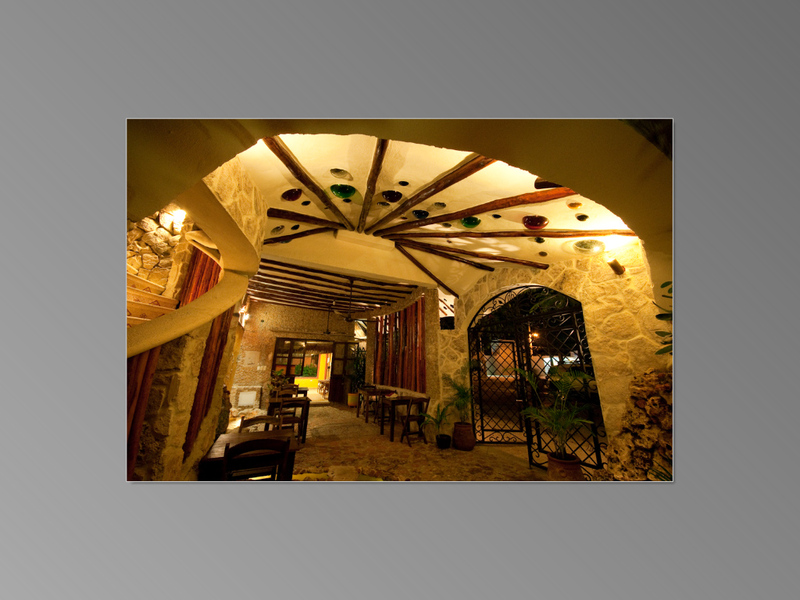 You will receive a 10% discount on all food and beverages and have full use of the facilities. To reach the Beach Club, go north on Hwy 307 and take a right on Boca Paila (the beach access road). Drive 1 mile to the t-stop and turn left. Drive .2 miles until you see the La Vita e Bella Hotel sign on the right and pull into the parking lot. 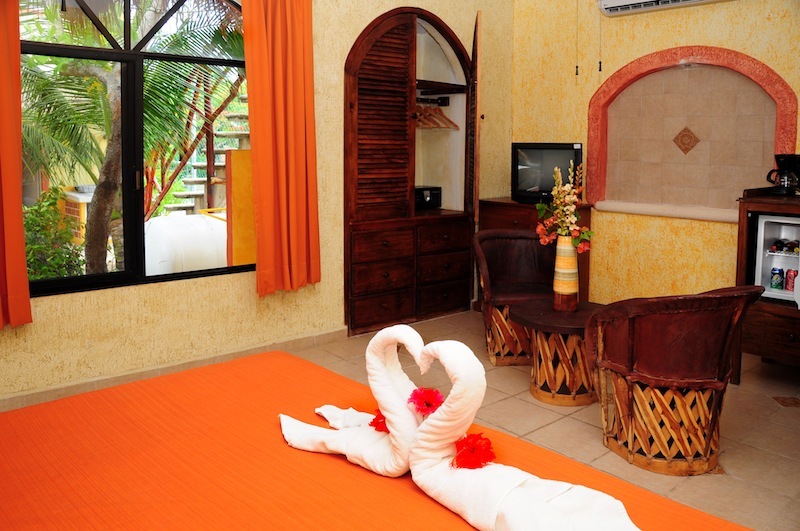 Our seven spacious rooms and friendly service make our charming hotel one of the best bargains in Tulum. All rooms come equipped with AC, safe, mini-bar, coffee maker, hairdryer, iron and ironing board, closets, umbrella and complimentary Wi-Fi. 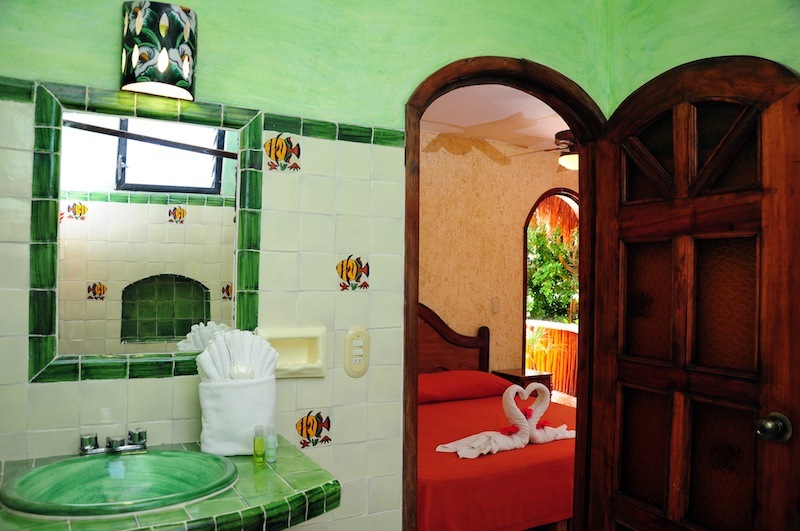 The private bathrooms are decorated with colorful Mexican talavera tile. 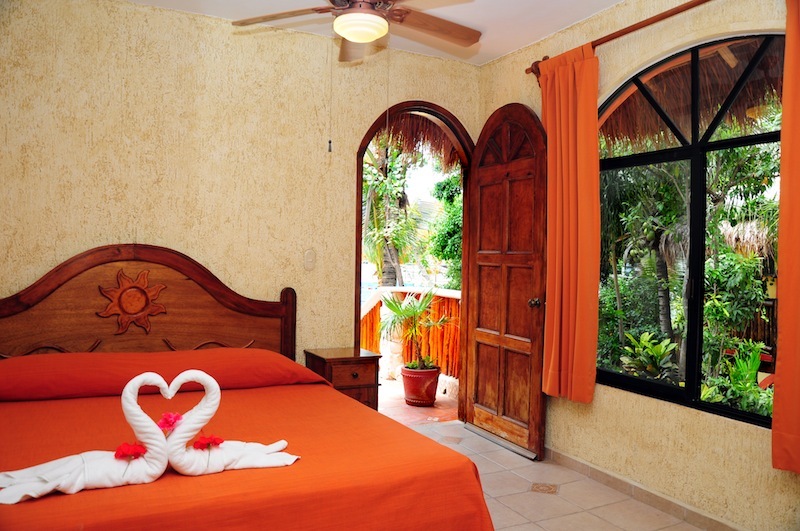 Standard rooms come with 2 twin beds or 1 king-size bed. Our penthouse suites come with 1 queen-size bed. One destination. Many worlds to explore. Located less than a mile away and situated on a cliff above the turquoise waters of the Caribbean, Tulum is one of the most beautiful archeological sites in the Mayan world. The city was built somewhere between 1000 and 1500 AD. At that time it was the center of commerce and transport of produce between the Caribbean and central Mexico. Today the walled city still has many well-preserved structures to explore and a small but lovely beach where you can take a dip. Chichen Itza was the center of the Mayan world between 800 and 1200 AD and is one of the most highly renown Mayan archeological sites. Its main building, “El Castillo,” was recently declared one of the new 7 wonders of the world. Visitors will also be impressed by the observatory, The Great Ball Court and the Temple of Warriors. Driving time to this site is approximately one hour. SIAN KA’AN is a biological reserve located within 20-25 minutes. Its 653 hectares include beaches, lagoons, swamps, cenotes, 345 species of birds and more than 800 species of flora and fauna. Visit here and you may catch a glimpse of a jaguar or even an endangered species like the jabiru bird. There are a wide variety of ecological tours to choose from which can give you an up-close and truly unique experience of the one of the Yucatan’s most precious natural treasures. 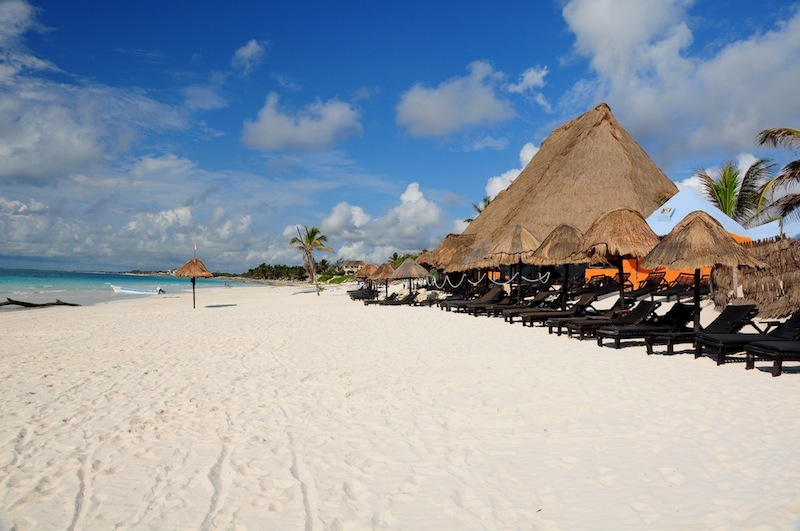 About 40 minutes north of Tulum, this ecological park boasts a host of activities. Go snorkeling in the famous caves and underground river, explore archeological ruins, enjoy a dolphin show, horses, bat caves, a stunning beach and much more. Whatever your age or sense of adventure, you’ll find plenty to do at this popular park. Just 45 minutes north you’ll find the happening city of Playa del Carmen. Home to a truly international group of people, the city has a cosmopolitan look and feel while still maintaining its small town charm. Much of the activity takes places along Fifth Avenue, Playa’s famous and mainly pedestrian area that sits just one block from the beach.